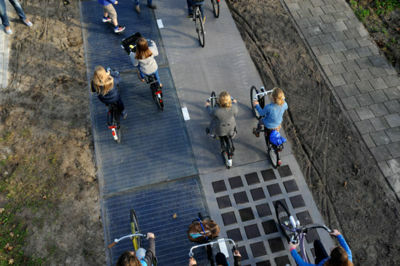 SolaRoad launched a test bike path in November 2014 that generates energy through solar cells embedded in the concrete. Dutch economics minister Henk Kamp cycled the first 70-metre pilot stretch of bike path on a busy provincial bicycle route north of Amsterdam. The payback from energy generated is better than what was expected. The company has revealed that its road has generated 3,000kWh of electricity over six months, or enough to power a single person's home for a year. The path only covers a 230-foot stretch in a Dutch village and provides a prototype for getting more energy from longer, wider roads. The project aims to harvest the sun's energy using an approach that could eventually also be used on roads. Concrete modules each measuring 2.5 by 3.5 metres, embedded with solar panels covered in tempered glass. Solar cells currently put the electricity they generate onto the national grid, but future plans include using the energy to power street lights. Electric bikes and cars will one day be able to refuel using contactless charging directly from the road or bike path. The aim is to have the solar road commercially available on Dutch roads within the next five years as the number of electrically-powered cars and bicycles grows. "The idea is that in the Netherlands we have approximately 140,000 kilometres of road which is much bigger than all the rooftops put together," Mr Stan de Wit said. "We have 25,000 kilometres of bike paths in the Netherlands." "If we can integrate it in our roads then we'll have huge extra potential for generating solar electricity." The country of 18 million - most of them cyclists - hopes to triple sustainable energy usage by 2020 and be "energy neutral" by 2050, Mr Kamp said. This page was last modified 02:49, 12 May 2015. This page has been accessed 4,634 times.